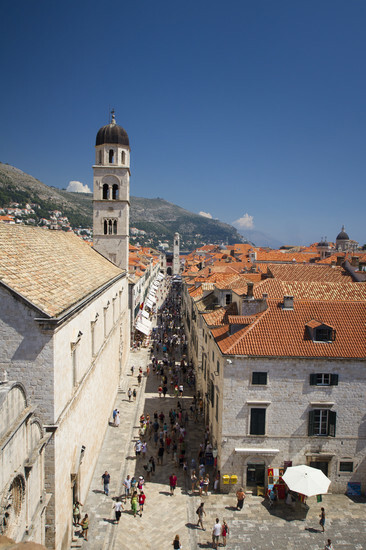 When talking about finding your way around town, you’ll often hear people referring to Stradun, which you won’t see on any street signs. 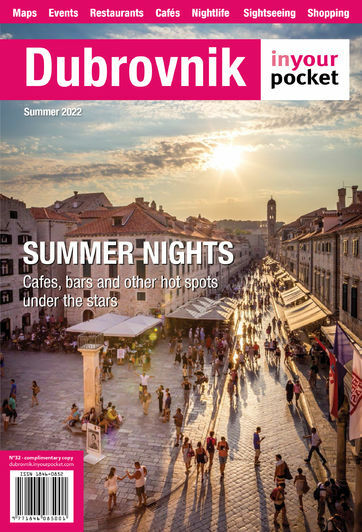 It’s the unofficial name for the main street Placa that joins the two main entrances to the Old Town at Ploče in the east and Pile in the west. The name comes from the Italian strada, meaning street. 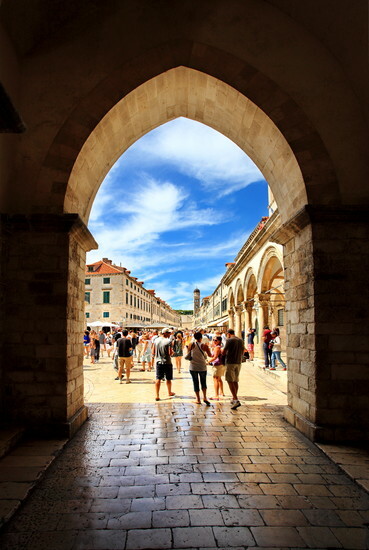 With its shining limestone flags and the uniform baroque buildings that line it, it is itself one of the best known sights of Dubrovnik. It’s the place people bump into and chat with friends on their daily business, and dress up for a stroll in the evening or at coffee time. 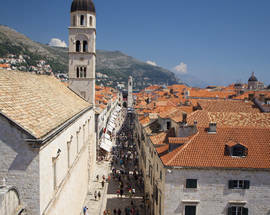 Stradun marks the dividing line between the earliest settlement and the parts of the city that followed. 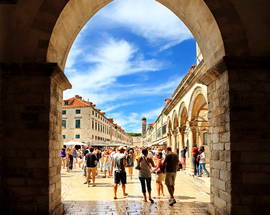 This first settlement was on the land south of Stradun, and was then named Laus, Greek for rock, since it was originally an island. From the name Laus came Raus, Rausa and then Ragusa. 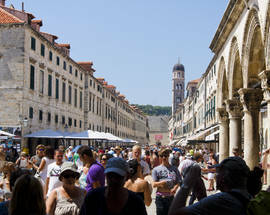 Although Laus has probably been inhabited by Illyrian peoples since the 4th century, it was colonised in the 7th century by Greco-Roman refugees from Cavtat fleeing Slav incursions. Later, Slavs settled the land across the narrow, marshy channel – this settlement was called Dubrava, from the Slav word for “oak tree”. 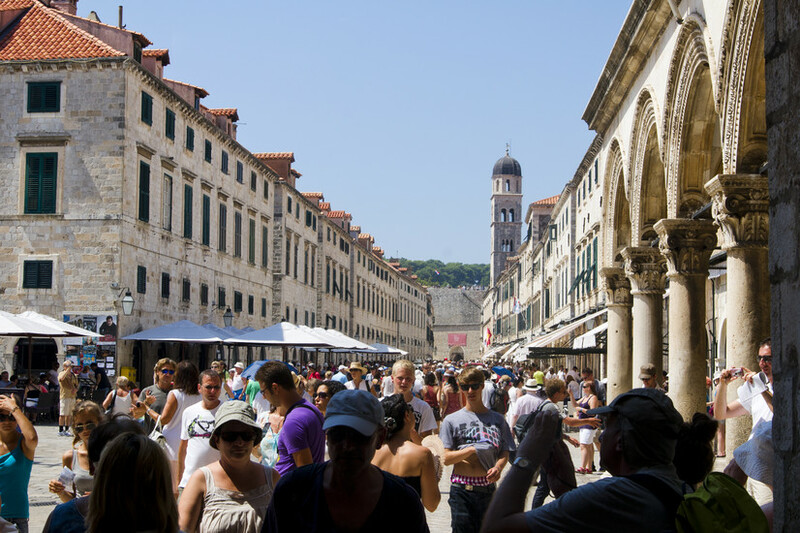 The channel was filled in during the 12th century, thus creating Stradun, and the two towns integrated and began to build the city walls.